Oracle Database XE is a highly useful, easy-to-use web-based administrative tool which is built on Oracle Application Express. It offers several advantages for developers and is a natural fit with JFreeChart. JFreeChart can be easily used to plot your Oracle database's data in a wide selection of high-quality chart types. The basic download procedure for JFreeChart is elaborated earlier in this tutorial. 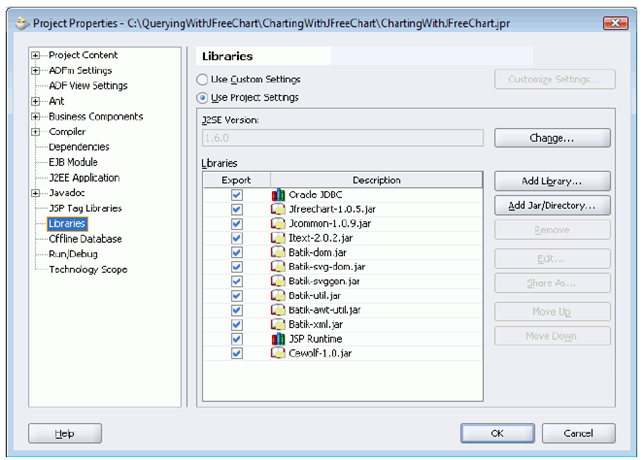 We will now understand how to configure JFreeChart libraries in Oracle JDeveloper. The following image shows the dependent JAR files necessary to build and run most of the programs with JFreeChart. The two JFreeChart JARs are listed in the above image, along with JARs for iText (for PDF generation), Batik (for SVG generation), and Oracle JDBC (for Java access of the Oracle database).